Kokanee Springs Resort is one of Canada’s finest championship 18 hole courses. 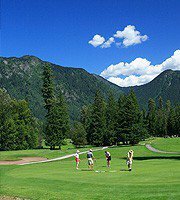 This graceful track, considered by many to be the flagship of Kootenay golf courses, resides in a magnificent mountain setting on Kootenay Lake. Every hole is framed by spectacular panoramic views of the Kokanee Glacier and surrounding area. Kokanee Springs is a Norman Woods original, characterized by it’s long driving fairways, immense rolling greens, immaculate course upkeep, and ability to interest and challenge golfers at all levels. After an unforgettable golfing experience, the fabulous Kokanee Lodge offers a quiet mixture of casual elegance and relaxation for those desiring mountain-style peace and tranquility. Kokanee Springs Resort is not yet in our pool of Golf Courses for orders.